Whether his prime motivation was to save his own skin or prevent the government from becoming embroiled in a public squabble it would be unable to win, Defence Minister Panos Kammenos sprang into action last week and assured Archbishop Ieroynmos, the head of the Orthodox Church of Greece, that plans to change religion classes in schools would not go ahead without an extensive discussion. Kammenos, who leads the junior coalition partner Independent Greeks (ANEL), proposed that a committee, including representatives of the church, be formed to discuss the matter despite Education Minister Nikos Fylis announcing his intention to alter the classes so they are more like religious studies than religious instruction. The ANEL leader’s intervention led to a meeting between Prime Minister Alexis Tsipras and Ieronymos on Wednesday night. Fylis, Kammenos and several bishops were in attendance as well. All the participants emerged saying that “misunderstandings” had been resolved and that all sides would continue to engage in discussion. The upshot of the talks seemed to be that the government backed down from its bid to change the textbooks used for the school classes, at least for the current academic year. The conciliatory words were in contrast to the sour mood that had developed between the government and the church recently. Fylis has been trying to gradually loosen the influence that the church has within Greek schools. Earlier this year he clashed with priests when he insisted that they need to obtain official permission before visiting local schools. The church reacted to his latest plan as well, prompting a war of words that included Fylis accusing the Church of Greece of enjoying a cosy relationship with the 1967–74 military dictatorship and Archbishop Ieronymos suggesting the minister had overstepped his authority and strayed into territory where only the Greek people, and not his government department, can have a say. Kammenos immediately distanced himself from Fylis’s plans and eventually played the firefighter, possibly because his limited supporter base includes many devout Orthodox Christians, including so-called old calendarists, and he cannot risk alienating any of them. Whatever his motivation, Kammenos appears to have brokered a truce into what was threatening to become an unseemly row. The events were a far cry from Prime Minister Alexis Tsipras’s first day as prime minister, when he went to visit Ieronymos at the archbishopric in central Athens and the two men held talks in a friendly atmosphere. In doing so Tsipras showed that, despite being an atheist, he was well aware that no Greek government can afford to get on the wrong side of the church. As an institution it may not have the political impact of the past, such as the 1990s when the assertive Archbishop Christodoulos brought hundreds of thousands of people onto the streets for protests against the removal of the “Religion” field from national identity cards, but its impact in Greek society is still deeply felt. Its role in shaping Greek minds from a young age certainly remains intact as the church has a prominent presence in schools and the academic curriculum. Alsp, the church has often transmitted a strongly nationalistic message, while fostering negative feelings about other religions or cultures. Also, while some of its clergy display remarkable tolerance and generosity, there are also those who have been responsible for disgraceful homophobic and anti-Semitic language. Even yoga has been a target for some Greek Orthodox priests recently. The church’s stance may be one of the reasons that Greeks tend to be much more suspicious about people of other religions. Despite having one of the largest Muslim minorities in Europe proportionally (610,000 people or 5.3 percent of the population, according to the Pew-Templeton Religious Futures Project), 65 percent of Greeks have a negative view of Muslims, one of the highest figures recorded by the Pew Research Centre in its Spring Global Attitudes Survey. According to Pew Research, 55 percent of Greeks also have an unfavourable view of Jews. Interestingly, researchers also found that although those on the right in Greece were far more sceptical, many on the left or in the centre also had negative views. In the case of Muslims, for instance, 81 percent on the right in Greece said they had an unfavourable view, followed by 65 percent in the centre and 50 percent on the left. This dislike of other religions also feeds into an all-round dim view of those from other cultures. According to Pew data from this spring, 63 percent of Greeks believe diversity makes their country a worse place to live and only 10 percent think it improves things. While there was no majority in favour of diversity in any of the European countries surveyed, Greeks were by far the least favourable to people from different racial and ethnic backgrounds in their country. Italy was next on the list with 53 percent. 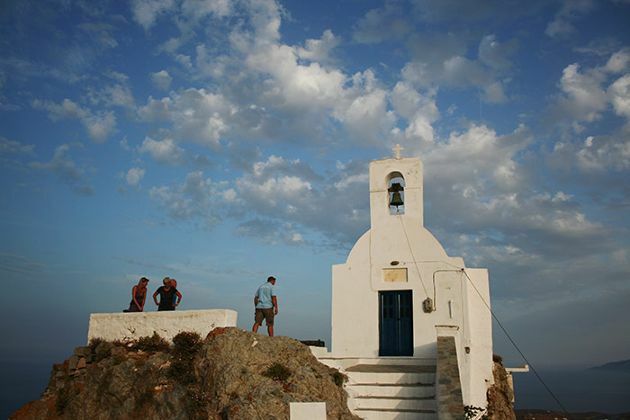 Religion also has a potentially significant part in shaping Greece’s foreign policy. The Greek public, for instance, has a much more favourable view of Russia and its president, Vladimir Putin, than is normal in Europe. This is largely down to the Christian Orthodox connection between Greece and Russia, although the prevailing scepticism in Greece about global engagement is also a significant factor. According to Pew Research, 89 percent of Greeks say it is more important to have a strong economic relationship with Russia than to be tough with it in foreign policy disputes. A median of 48 percent of Europeans feel that the economic ties with Russia are the most important thing. Given all this, it is clear that taking on the Church of Greece is not simply a matter of changing the structure of religious classes; it is about delving into the Greek psyche, which has been so greatly affected by the church and its teachings. This is not a task for a government with a three-seat majority and a conservative opposition banging at its door. The risk of alienating voters, who do not necessarily have to be devout Orthodox Christians but who hold the church in esteem for traditional reasons, is just too great. In its fragile state, the coalition also cannot afford another open front. Squabbling with an influential institution like the church is one thing, but doing it when you are also trying to reach an agreement with Greece’s lenders and to fend off accusations of corruption requires the kind of political strength and popular support this government does not have. In fact, it is not even a task for an opposition party that is dominant in the opinion polls. Amid the back-and-forth between the government and the church, it was noticeable that New Democracy swiftly took the archbishop’s side. Despite his reformist and moderate profile, opposition leader Kyriakos Mitsotakis cannot risk upsetting the right wing of his party and its socially conservative voters, for whom the church still holds a special place in Greek life and identity. This means that the row with the church, which has also done significant and valuable charity work during the crisis, will probably simmer away over the months to come, threatening to boil over from time to time, but the actual impact on Greek education or everyday life is likely to be minimal. After all, they do say that the best way to kill an idea is to get a committee working on it.